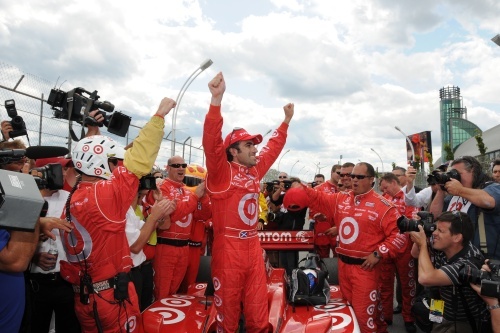 Dario Franchitti secured his third win of the season in the Indy Racing League yesterday around the street circuit of Toronto. The BRDC Full Member made good tactical use of the yellow flag periods in an incident packed race although he still had to fight for positions to gain his lead and eventual win. Second placed Ryan Briscoe was among the debris victims picking up a puncture, but he managed to get back in the thick of the action to take the runner-up spot. BRDC Full Member and winner last time out, Justin Wilson, finished in fifth while fellow Full Member Dan Wheldon overcame his own problems and contact with Richard Antinucci to finish 14th. Dario now returns to the head of the championship leader board. BRDC Full Member Stefan Wilson finished the Indy Lights race in Toronto in fourth place for Walker Racing. BRDC Full Member Karun Chandhok finished the first GP2 race of the weekend at the Nurburgring in 11th place. Race two did not go to plan though as he retired on the first lap.